I wonder if there was any stretching in the mold when this pieces was done. Sometimes you get that when pieces are put into production. Could be a case if the face is any different. Kit posted this awhile ago. I'm not sure who's it is, but it does match Hadafang though. I also noticed the matching knife in the saddle but I'm sure I've seen it somewhere before so I assumed it was "known". Can't remember where I've seen it though... Not the Kit Rae picture, perhaps in one of the Hobbit Chronicles books...? I wish UC would make it and Wormtongue's dagger as well. Arwen looks more like Liv more recently than 20 years ago. Although I believe likeness could be better I see Liv in the statue, specially from the sides. I hope to get her. 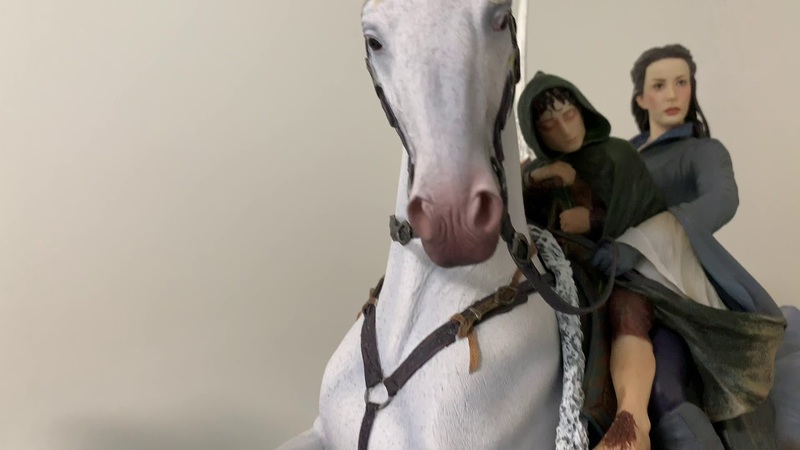 The statue is incredible, very good paint app on these pictures, the only weakness is the HS, as almost all Weta's figures.They are at the top concerning details, proportions, creativity, but the HS is always a little weak. They need to hire some Hot Toys sculpters , they are by far the best in likeness! But I can't wait to receiving this one very soon! HT have problem with women's HS too (and their fishy face), except maybe Hela . Last edited by Alwayshappy; 12th February 2019, 01:02. Very nice video. Does a great job of showing things off. Thank you! Just edited the clip, the first time I uploaded the clip it could only be viewed in 1080p, while I shot with 4k. Now it's watchable in 4k. No problem. Uploading to the highest quality can take a few mins with YT for some reason. If you're using an older computer like I am you may not be able to process the 4k video. It's one of the reasons I'm going to be trying to get a new Mac before I start reviewing again in the spring. I just used my phone to upload it to Youtube, but the upload was set on 1080p, I just had to change it to 4k. Then it worked without any issues. Didn't edit the video though, otherwise I would have used my MacBook. 4k upload took 2 minutes with my phone; the latest iPhones are incredible fast (my old one was a 7). I've thought about doing that sometimes for like update stuff. Just never get around to it. Yes they are. They're all I use to make all my reviews and Con videos. Thanks to all for the great photos (and video! ) posted on the last couple of pages. Now I really can't wait to receive mine! I noticed it when the first batch of in-hand pics were posted here. I was looking for Hadhafang's scabbard and then noticed the additional smaller blade. Very intriguing. I'm loving the details on this piece. Talk about teaser! Now I need the next video to cover the other side where the scabbard is, as well as the tail, and the back of her hair . . .etc. Noticed that too, she is in every e-mail. I've tried the best I could. Was hassle enough to put her on top of that showcase, so my angles were somewhat limited. Sorry it wasn't enough. All times are GMT+12. This page was generated at 18:45.